Visit Aquatica Water Park, the new Sea World water park in San Diego, California. This seasonal waterpark has all the great rides, slides, wave pool and a relaxing river for kids of all ages. Aquatica, the Sea World Water Park, is located in Chula Vista in the south part of San Diego. It is a popular destination on hot summer days. It is located at the former site of Knotts Soak City water park. Best times to visit Sea World water park is early morning, where you can grab a lounge chair and don’t have long waits in the lines. Cabanas are also available to rent (advance reservations recommended). If you are looking for a San Diego water park in north county, try The Wave Water park, or if visiting Legoland, the Legoland water park. If you are in northern LA area, try the Six Flags Hurricane Harbor water park. Let's face it. We go to water parks for the fun rides and attractions, otherwise we would just go to the local swimming pool. So here are some of the great water slides, rides and wet attractions at Sea World's San Diego waterpark. 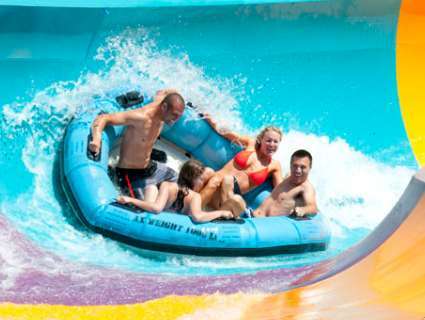 Taumata Racer - New high speed water ride at Aquatica Water park in San Diego. Fast and fun. Tassie's Twister - This is the best ride! Either 2 person or 4 person raft ride (shorter line for 2 person) as you spin down this awesome drop. 48" height requirement. Big Surf Shores - This large wave pool becomes an exciting play area when the waves come. All ages, but life jackets for those less than 4 feet tall or inexperienced swimmers. Whanau Way - Six (6) body slides for more fun. Some slides are enclosed and some open. Must be 48" tall to ride. Walhalla Wave - Family raft ride. Must be 42" tall to ride. Walkabout Waters - Family Funhouse with buckets full of fun. Must be 42" tall. Slippity Dippity - Kid's slides for those under 48" tall (parents welcome too). Loggerhead Lane - This lazy river is great to float in and relax as you journey around. All ages, but life jackets for those less than 4 feet tall or inexperienced swimmers. 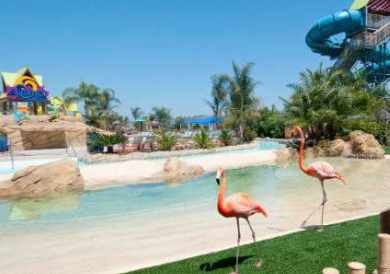 Flamingos and Fresh Water Turtles - Enjoy seeing these interesting creatures at the Aquatica water park. SeaWorld Aquatica Water Park in a mid-size San Diego water park in southern California, open Memorial day weekend, June – August and weekends in September and early October. Arrive early as if attendance is high (especially on a hot weekend summer day), they may not allow additional guests into the park. Sea World Water Park Hours: The park is open daily from Memorial Day weekend to Labor Day September 5, and weekends only through October 9. The park typically opens at 10 AM and closes either at 5 PM, 6 PM or 7 PM. Check the official site for the opening and closing times. 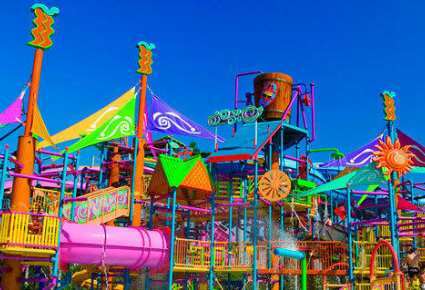 Aquatica Water Park Prices and Discounts: Tickets cost approximately $44.00 adults 10 and older, kids 3-9 $38.00, ages 2 and under are free. For discounts, click on the banner below and choose the Go Select San Diego option and customize your package for San Diego discounts. They also offer season passes with a special limited time Splash pass offer for the season! Food: You may bring water bottles but you may not bring your own food into the park. Tip: Freeze a large water bottle for each person at home before you leave, and you can have ice-cold refreshing water to drink. If you keep an ice chest in your car, you can exit for a picnic lunch if you prefer to not eat the theme park food. What to Bring - Bring your swim suit (no thong type suits) of course, towel, plenty of sun screen and a credit or debit card to purchase Discovery Dollars. This allows you to set up a spending account for food purchases, without having to carry cash. Everyone in your family will receive waterproof wristbands for purchases, so there is more time to enjoy the rides! Life vests are provided. You may bring swim masks and goggles, Waterproof protectors required for kids in diapers. Directions to Sea World Aquatica Water Park from Interstate 5 - From San Diego, go south on Interstate 5 past the 54 Freeway. Turn left (East) on Main Street and go approximately 5 miles. Turn Right on Entertainment Circle to the end of the street. Directions to Aquatica Water Park from Interstate 805 - From San Diego, go south on Interstate 805. Exit Main Street/Auto Park Drive. Turn left (East) on Main Street and go approximately 2 miles. Turn Right on Entertainment Circle to the end of the street. Directions to Aquatica Water Park from SeaWorld California - From Sea World San Diego, take Interstate 8 east for 5 miles, then head south on interstate 805 for 14 miles. Exit Main Street and turn left. Continue on Main St. for 1.8 miles, then continue straight onto Heritage Road for 0.5 miles. Turn right on Entertainment Circle. Click on the link above to open the Google Map for Aquatica Sea World Water Park and other attractions in San Diego and southern California.